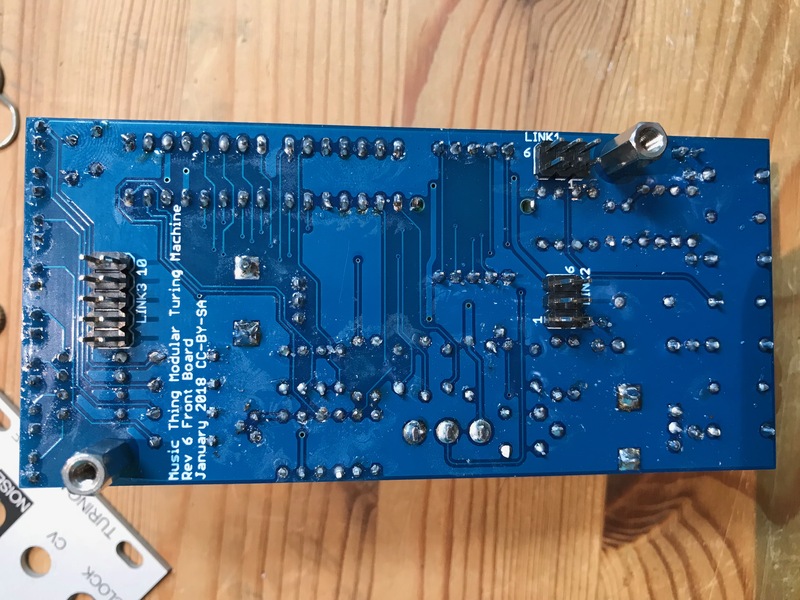 Just bought a Turing Machine mk2 that someone else has made. 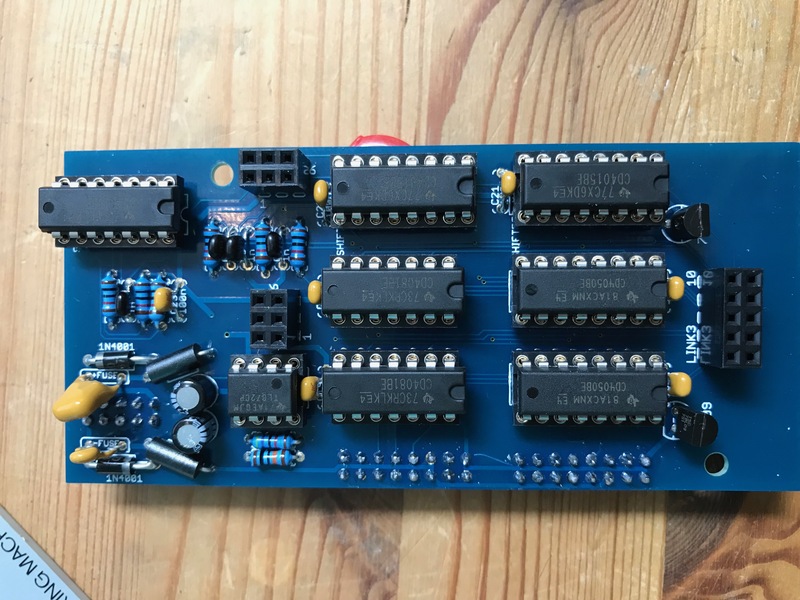 Weirdly LEDs 4-8 never light up and these steps do not function in the sequence, even though the seller says they did right before it was posted. Is there some obvious thing that could have happened in transit to turn off four of the LEDs? I've looked for loose connections but can't find any..
neil.h.edwards82 - I build a lot of these. It's very likely a problem with one of the 4015 chips on the back board. The one in the corner is the one that drives the visible 8 LEDs and is my top suspect for your problem. The other 4015 is for the 8-16 steps that aren't illuminated. I would first try to remove and re-seat the 4015 chips. If that fails, swap the 4015 chips. If that fails then move around the step knob and see if that changes the behavior at all. building a VOLTS expander, alredy soldered all parts, but I don't have any 100nF Capacitors around. Are these absoultely crucial or can I use some different values instead? Are these absoultely crucial or can I use some different values instead? A big electrolytic won't filter the high frequencies a well as even a small ceramic. I finished my Turing MKII yesterday and am very happy with it so far. I'm pretty stoked that it was a successful build as it's my 1st powered build and I made some fairly messy errors like soldering one of the IC's directly onto the board I had no joy in trying to remove it so it's still there. I have a few kits lined up including pulses. Do i need any special tools for the smd stuff? I also have a Penrose quantiser waiting. How does that compare in terms of build hours/skill level? Penrose is no more difficult than turing in terms of build level. Main thing to be careful with is making sure the buttons are properly aligned with the front panel. Leaving the IC in place was the advice of Thonk too so it stays. Going to start looking into smd soldering today. After a succesful build of the Turing Machine I have completed the Pulses build buuut managed to completely disregard the warning on the github page and used high intensity LEDs and soldered 2k resistors instead of something higher... They are terribly bright but I could possibly live with it and have also ordered replacements already (same LEDs as on the Turing). However not all LEDs light up and the corresponding jacks to the ones that do not light up also don't give out any signal (no matter the incoming clock signal on the Turing). Could this be caused by the LEDs and the wrong resistor values? EDIT: Fixed. I simply swapped the LEDs out to the not super bright ones and now it works. Except for one (probably shoddy soldering) but that'll be an easy fix hopefully. 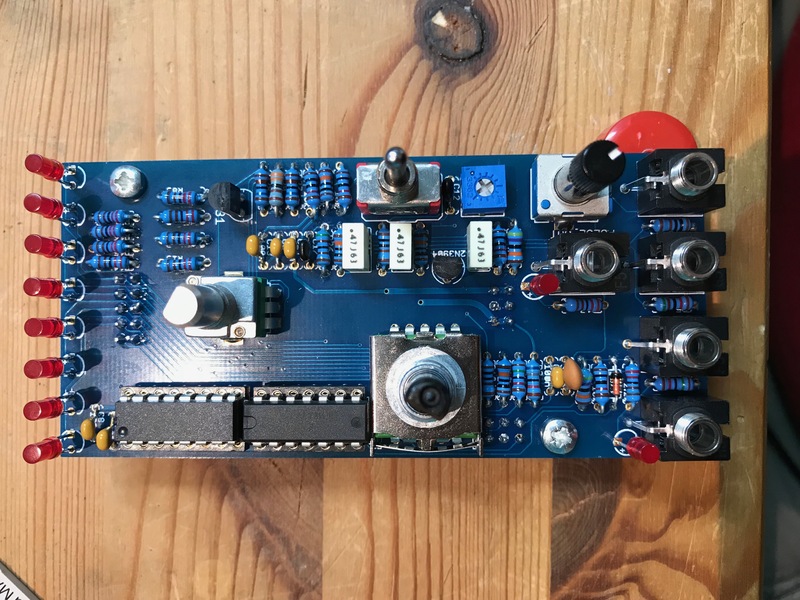 Built the Turing Machine Mk II, Pulses Mk II and Voltages this weekend. What a great set of modules! And I'm happy they work right first time. It really helps to check your work while soldering, so you can fix things before you fix the modules into your rack. 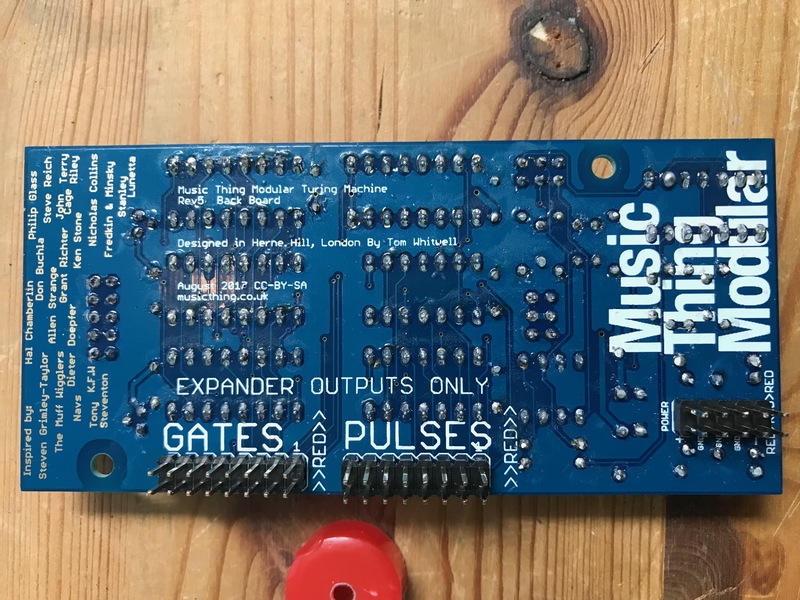 ... weeeeellll, maybe too soon for patting myself on the back: the pulse led on the TM and the leds on the Pulses shine really dim, much less than the shift register leds. Anyone else notice this? Edit: Solved. Seems the led brightness is related to the clock voltage. Was using MI Grids in alternate output mode. Apparently the clock trigger is a little short for the TM. Hi ! Is it possible to use resistors as a substitute for the ferrite bead ? 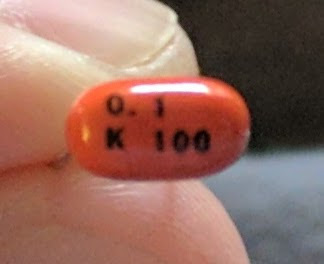 I just noticed i forgot to get some. I remember having read somewhere that 10R or 22R can be used in place of the ferrite, is that the case here ? Can anyone help with this question? The BOM only says "2 FERRITE BEAD" with no specifications. Can I pick any ferrite bead? There's a million to choose from. The Ferrite beads are there to filter high frequency noise from the power supply. I personally think they are overkill because RF noise shouldn't be a big factor for most of us (unless you live next to a radio tower), and a lot of other modules work fine without them. You can almost certainly omit them from the build and just use a piece of wire. A resistor isn't going to accomplish the same thing as the ferrite, so my advice is to just use a piece of wire. You'll be fine (unless you live in a radar facility or next to a radio tower). Sorry, I didn't fully answer your question. The Turing schematic specifies the Ferrite as B1-BL01RN1A1D2B or Mouser 623-2743001112LF (Fair-Rite 2743001112), which has a Z of 68 ohms at 100 MHz. getting onto the power supply bus. off the nail head and encapsulate in shrink wrap. I am also having issues with my TM MKII build. Like others in this thread LED 2 doesn't light up. As well, it will occasionally drop pulses. In the audio file you can hear that it just cuts out, but comes back on again. I thought the build went rather smooth but unfortunately there is something wrong. Woops ... sorry. This is normal behavior and I found a broken trace that fixed the LED! 100% working now! I really like the module so far, and the documentation is ace. My new friend makes melodies obviously the next step is a nice quantizer. Sorry for not reading the entire thread properly, but I need help to troubleshoot a problem with the TM MK2 that I built today. When it's supposed to be locked it looses bits at the end of the cycle. It happens regardless of the clock that I use (tempi / rampge). I guess that the problem is with the bottom board, because it seems to be related to the shift register (isn't it?). I can't see any issue with the board. Not wrong resistors, problematic soldering, etc. The only thing that I suspect is that I didn't clean the board. Do you think that it might cause the problem? Otherwise, where should I look to find the issue? EDIT: I swapped C15 and C16 by mistake. Will fix that in the next few days, check again, and will let you know if I still need help. Yeah, problem solved, it was the capacitors. I have an issue with mu recently built TM Mkii. Basically it's as though it won't unlock a pattern. I've checked there's no shorts, no components in the wrong places, replaced the TL072 and TL074 and reflowed all the solder. The guys from Thonk have been giving me some help, but I'd thought I'd throw it out to a wider audience. Can anyone think of something else to try? Does the lock pot do anything to the sound while calibrating? Nope, does nothing at all. Thonk, very kindly, sent me a complete set of ICs and new lock pot to change, but nothing has changed. Do you have any decent high res pictures of all sides of both boards. Have built many, many Turings and have a couple here I could compare components against yours if you post some decent pics. It's defo gonna be fixable I'd think. Hi woodster, here's some links to hires images. The switch is putting data into the shift register and it's looping in the video so the shift register is good. If there is nothing coming out of the Noise output on the panel then check the noise circuit (T1, U1C and U1D). If you have Noise output then check the comparator circuit IC7 and routing circuit SWITCH_IC. If you have an oscilloscope then it should be easy to track down. If you have a meter and know how to use it then slow the clock down (2-4 Hz) and start probing. You should see things switching and a bit of voltage pass the op-amps in the noise circuit.